Recovering mentally after a loss is no easy task. Soccer players who are highly competitive and dedicated to their sport often have difficulty moving on after a disappointing defeat. 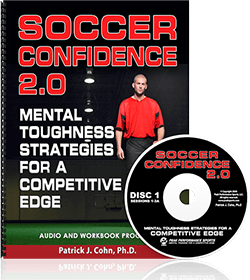 Many of the soccer players we work with at Peak Performance Sports, are too self-critical and lose confidence after losing a close game. Our goal is not to convince you that losing is OK, but rather to help you grow from failure, stay confident, and learn from adversity. The reality is that losing is a part of soccer. If you won every game, tournament, and championship you ever played, our guess is that soccer would become pretty boring. Fighting for the win, grinding it out, and giving every last ounce of energy is what soccer players live for! Sometimes you earn the big “W” and sometimes you don’t. The most important thing is how you bounce back after a loss and move forward to the next game. 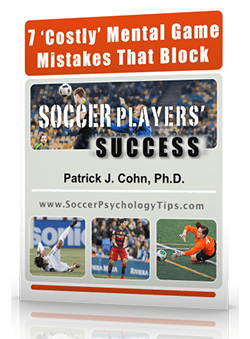 Every soccer player feels some disappointment and frustration after a loss, but the danger is when players get stuck in a negative cycle, causing them to lose more confidence (or what confidence they had), which leads to future poor performances. The first option after a loss is to get upset, frustrated, and angry that you did not perform up to your ability and carry these negative feeling with you for hours or even weeks after competition. 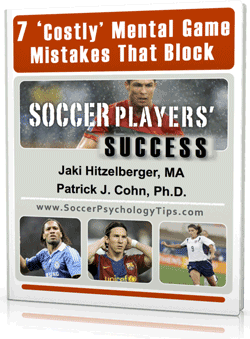 This option will not help you move on and can interfere with your motivation in soccer. The second option is to learn how you can improve by objectively assessing your game, without negative emotion. This will help you grow your confidence and composure. Sure you want to be real about how you can improve, but you also want to focus on what you did well in the game in order to carry that on to the next game. The best option is to learn, grow, and move on, which is the mindset of a champion. I always tell my players that the most important in a game is to work hard and learn with their mistakes, keep your heads up and never stop fighting for what you believe. Think about what you did wrong in the game, even when you won and try to get better on it. Think about what you did right and try to get it again in your next game. We cannot win everything but we can learn with everything we do. Thanks for your comment, great coaching philosophy! I have always play soccer in high school and some college. Now that I’m an “adult” I only get to play on Sunday Adult leagues lol. However last week I had a league final game with my current Sunday team. Tied 2-2 regular time with a man down. Tied 1-1 on extra time but lost I penalties. Idk why but I keep feeling bad, all my teammates missed their penalty shot, I was 3rd to shoot and I also missed even though I felt confident at first but failed at the end. ;( hope I bounce back asap. Just sharing some experience ty.